Bear & Co. is a fictitious immersion into the world of being part of an IOT start-up. We invite visitors to join the company, and put them through various ethical approaches as they become part of the company. First they must state their values - what they will bring to the company and care most about. Then, we test those values through different scenarios and problems that are unexpected and don’t have easy answers. After a “worker” finishes, our software program compares the values they stated on their punchcard - the things they think make Bear & Co. a Good Company, with the decisions they actually made. Sometimes there will be a misalignment - a tension - between the values they stated and the choices they made. That’s fine - but we should be aware! So that tomorrow when they come back to work at Bear & Co., they keep an eye out for those possible issues. Bear & Co. is a way to rehearse, to practice ethical thinking and decision-making for a product that’s not even yours - a role-play, if you will. In that way, when confronted with actual major and systemic problems when working on your own product or project, you might be better equipped to solve the issue - or at least to try to solve, and then try again. Currently the project is in the Research phase where we are continuously reading, annotating and sharing whatever topics that swarm around ethics, technology, connected devices and algorithms. In our role of designing tools for ethical thinking while making connected products, we need to work with those who make the products and understand their questions, needs, problems in order to identify the opportunities for which we can design. 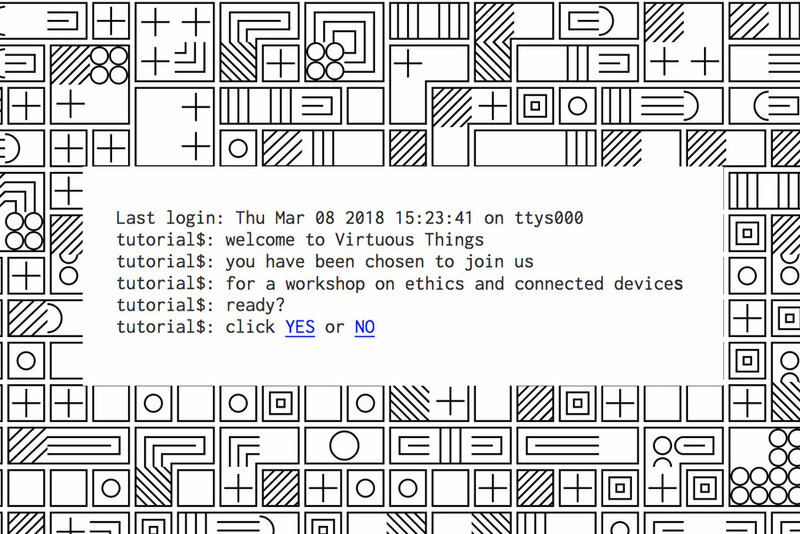 We started by facilitating a set of workshops in Amsterdam and London with developers, designers and studio heads where we will delve into how ethics surfaces in the IOT development process. In that workshops we try to identify values, ingredients and actors involved in the process of creating connected devices as well as zooming into the challenging moments and trying to understand how, by who and when are the ethical decisions associated with this challenging moment being made. Second part of the workshop is allowing the participants to speculate and get into the mindset of thinking about those decisions on a longer time scale and in a more system-lever perspective. We've build tools that help them imagine their products far in the future asking the question "What kind of technological, ecological, social, economical, cultural or political impact your IoT device would have in the world?". Through that exercise we try to unreveal positive and negative visions, looking at the project from a different perspectives and understanding what future the product is building and what kind of ethical implication it is proposing. "Ethics comes up when things go down"
Designing tools for ethical thinking when designing connected devices. We are daily exposed to news telling creepy stories about smart objects gathering people’s data, yet such an unethical practice is widely left unaddressed for the sake of technology-led economic-growth. No one yet knows how to solve the challenges of ensuring ethical data practices in the way new technologies are designed. The EU has made significant legislative and advocacy efforts to address societal concerns brought about by technological innovation in data processing. Nevertheless, we lack practical guidelines and assessment procedures to embed ethical, social and data protection values in the design and development of data intensive technologies and services. VIRT-EU applies an interdisciplinary research approach to generate new knowledge and methods that aims to overtake the unproved assumption according to which technological development leaves no room for ethical and moral reasoning. Virt-EU aims to intervene at the point of design to foster ethical thinking among developers of IoT solutions. In fact, addressing social concerns in new technologies, not only impacts changes in regulatory regimes but also influences the process of imagining and developing the next generation of digital technologies within European clusters of creative innovation. Project aims to develop actionable tools to encourage reflection among developers on the relationship between technological innovation and societal concerns, to enable a self-assessment of ethical and social impact of the envisioned technologies. We will use our expertise in participatory methods and speculative design to develop tools and materials for developer communities and other stakeholders that will be made available to the communities through our partner organization ORGs developed online presence as well as the VIRT-EU website to make self-assessment tools, actionable scenarios for ethical reflection and design and scripts for engaging in interdisciplinary collaborative workshops and discussions available to the European IoT developer community, civil society organizations, activists and other stakeholders.